Gorgeous garden with decked area for outside dining. Close to everything! 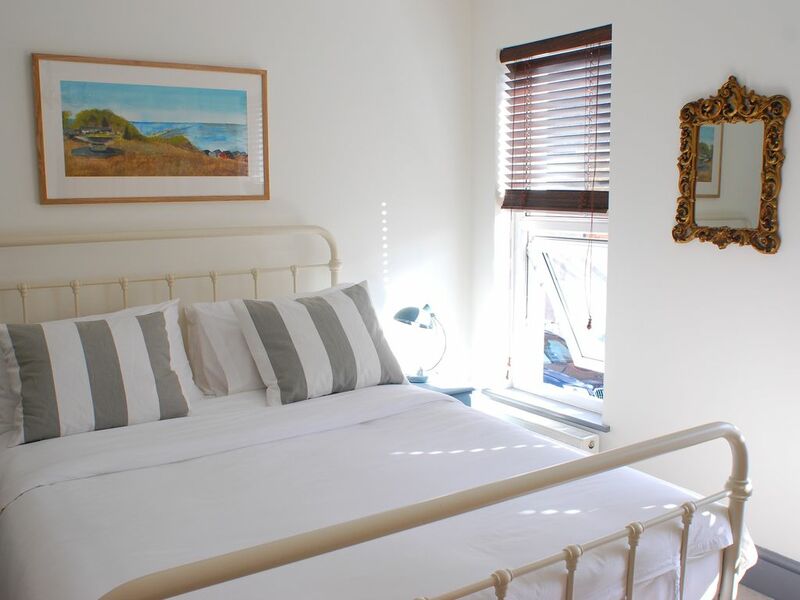 Neptune Cottage is a Victorian terraced house in Whitstable's conservation area, a two-minute walk from all that Whitstable has to offer; Beach, Working Harbour, boutique shops and wonderful seaside pubs and restaurants. There are three spacious bedrooms on the first floor decorated in Farrow and Ball colours and with crisp white Soak and Sleep bedding and luxury mattresses. The master bedroom has a new king size, John Lewis Hypnos mattress and the middle bedroom has a new double. The twin room features a Heals store bed allowing the room to be used as either a twin or single; please us know if you would like the room set up as a single room. The open plan living/dining area is equipped with stylish sofas and a wood burning stove for cozy and warm winter nights in front of the fire. We have a beautiful garden with olive trees, and a lawn as well as a fabulous outdoor seating area on the decking where you can enjoy the sea air in the peace and calm of our lovely neighbourhood. Our dining room features a range of stylish lamps, down-lighters and dimmable ceiling lights offering different options for mood lighting. We are keen cooks, so the kitchen is extremely well equipped with everything needed to cook delicious meals celebrating the wonderful produce available locally from the sea and Romney Marsh. Whitstable is a thriving and characterful town famous for its native Oysters and locally caught crab and lobster; the beautiful sunsets are legendary and much loved by painters and photographers alike. With miles of stunning coastline, even in high season, you can find yourself a secluded beach between the groynes to sunbathe, swim or picnic. As well as offering the obvious pleasures of the sea, Whitstable is also a thriving port and town with freshly caught local fish , superb restaurants and amazing beach pubs where you can enjoy the famous sunsets with a glass of chilled wine in hand. We have lots of interesting independent shops and local artists. There is an alternating weekly antique and farmers market where you can enjoy meeting local producers and enthusiasts. There are lots of exciting activities to keep an active family busy and we are happy to offer you recommendations of things to do as well as a restaurant guide. As a family some of our favourite things to do are swimming in the sea, cycling along the coast (we have a lovely cycle hire shop nearby and crabbing in the harbour. For the more adventurous there are also windsurfing lessons and organised boat trips to the famous Maunsell sea forts. Historic Canterbury is a short bus ride away and of course Margate and the Turner Contemporary are easily accessible by train. Neptune Cottage is just over an hour away from London (train or car) and Canterbury is only 7 miles away. You can even cycle to Canterbury from Neptune Cottage in under 40 mins along the wonderful Crab and Winkle Way. All the original paintings in Neptune Cottage are of Whitstable beach and are painted by our son who is currently studying at UAL, Wimbledon College of Arts; Please let us know if you would be interested in commissioning you own! We are keen travellers and have six children ranging from 18 to 24 and both work in primary education in leadership positions. We have been visiting Whitstable since our children were small and have long been in love with the entire area. Neptune Cottage represents everything we have learnt from being travellers ourselves and aims to provide you with ultimate hotel luxury and comfort in a private dwelling. We have tried to think of everything to make your stay the ultimate home from home experience down to the smallest detail and hope our guests have a really memorable stay in Whitstable. Enjoy a wonderful day on Whitstable's beautiful beaches, browse in the quirky shops and make the most of fresh seafood and oysters in the lively restaurants that Whitstable has to offer. At the end of the day you will return to an oasis of peace, calm and tranquility in a beautifully furnished house with a gorgeous garden in Whitstable's conservation area. Spacious and newly fitted family bathroom. Bath tub, vanity unit, hand held shower. 5 mins walk from beach, harbour and all shops and amenities. Really lovely property in a great location. Thoughly enjoyed our stay at Nepture Cottage. Small problem getting the shower to work was fixed on the same day as reported to manging agent. Comfy beds and everything you need for a relaxing short-break. Hi Lynda, thanks for you review, so glad you enjoyed your stay. The shower is new so perhaps was a little stiff, I gather from our housekeeper that all that was needed was a little WD40. Wonderful, charming cottage. Plenty of space with a wonderful yard! Great location, close to town! We loved our stay here! The cottage was a relaxing, perfect place to come home to. It was beautifully decorated with everything we needed. Thanks for your lovely review you were great guests. Welcome back any time! Best wishes Sophie, Julian and family. Whitstable is a thriving and characterful town famous for its native Oysters and locally caught crab and lobster; the beautiful sunsets are legendary and much loved by painters and photographers alike. We have lots of interesting shops and local artisans, offering bespoke lamp shades, local cheeses, quirky antiques and beautiful jewellery and household luxuries. Every one in in Whitstable, visitors and residents alike are passionate about the town, the Kent Coast and Romney Marsh. We are just over an hour away from London ( train or car) and Canterbury is only 7 miles away. You can even cycle to Canterbury in under 40 mins along the wonderful Crab and Winkle Way.